Come join us on National Trails Day (Saturday, June 3) as we begin work on bringing the Santa Cruz Trail back to life! • We’ll meet at First Crossing (34.545955, -119.779028 – about 30mins from Santa Barbara) at 8am on June 3. From there we’ll caravan across the river and through locked gates (locked at Lower Oso) to Upper Oso. 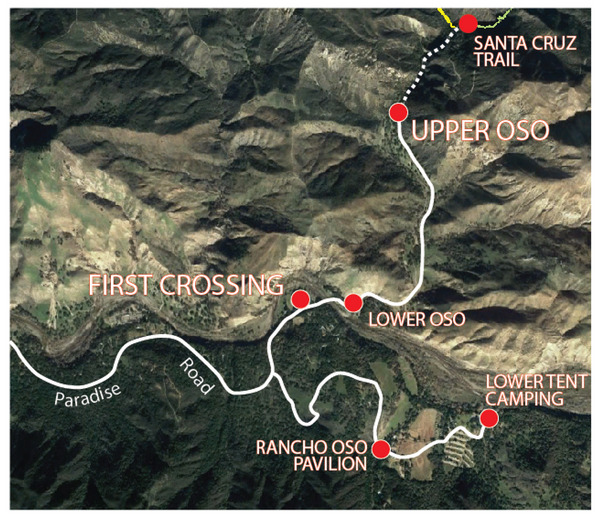 We’ll park the cars at Upper Oso and walk the 0.7 miles to the start of the Santa Cruz Trail singletrack. Parking is FREE! • If you are running late, we a second caravan leaving First Crossing at 8:30am. • Once at the Santa Cruz Trail, we’ll do a safety talk, explain the plan for the day and break into teams to start work. All of the work will be along the 1.3 miles up to 19 Oaks Camp. • We’ll have hard hats, gloves and provide all the tools for the day. 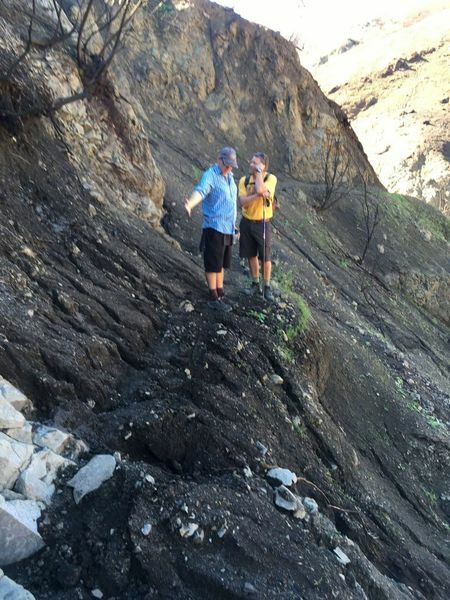 Please wear long pants, sturdy boots, eye protection (sunglasses are fine) and you might want to bring a helmet (bike helmet is fine), personal gloves and a favorite trail tool if you have one. • You’ll also need to bring any water and food needed to get you from 8am until 5pm. • It’s predicted to be sunny with high temperatures in the low 80’s. There should be a light breeze by mid-morning that will hopefully help keep things cool as well. It will be warm for sure, but not hot by Los Padres standards. There is plenty of water in the creek and enough shade here and there to cool down during rest breaks. Take as many breaks as needed! • Most of the work will be clearing rocks, burned slough and ravel from the trail bed, plan on getting dirty! Everyone likes getting dirty, right? • We’ll work with our teams until the early afternoon and have two departure times from Upper Oso out through the locked gate at Lower Oso. The first departure time will be around 12:30pm and the final one will be at 2:30pm. 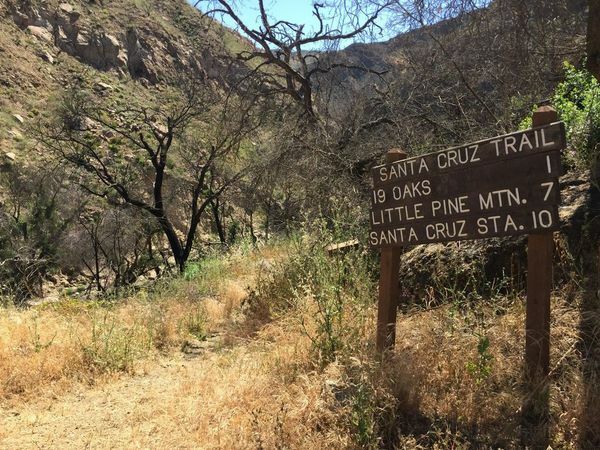 As you probably know, this portion of the Santa Cruz Trail was burned in the August 2016 Rey Fire and this project will be the first official work to clean up the damage from the fire. The trail is in bad shape but all things considered it could have been much worse. The trail is certainly not dead, it just needs a little love. It will be very rewarding hiking out and seeing all the work that was accomplished out there! You’ll feel great…..
• Once we’re out past the Lower Oso gate you are free to head home, take a swim in the river or drive up to Rancho Oso for the evening. 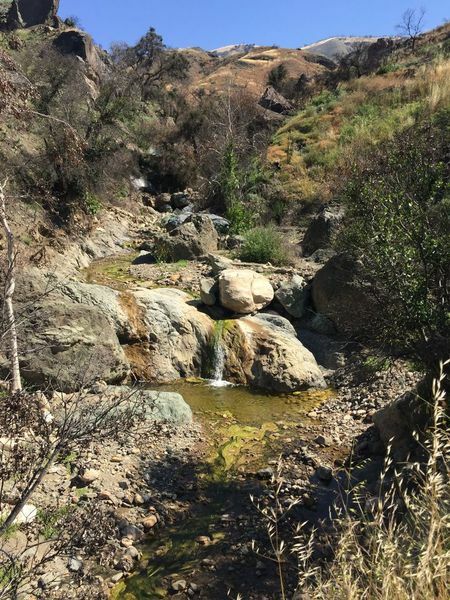 • Camping is FREE at Rancho Oso for the trail volunteers. We’ve reserved the Lower Tent Sites down by Arroyo Burro Road. If you drive into Rancho Oso, tell the front kiosk you are with the LPFA and they’ll point you in the right direction. Feel free to setup your camp, take a swim in the pool (shower first of course) and then eventually head over to the Screened Pavilion and Chuck Wagon for the REI Chill Zone and some much deserved ice cold beer compliments of Hollister Brewing. • BBQ dinner will be served between 4-5pm. If you’re not staying the night, let the front kiosk know you are just there for dinner and they’ll guide you to the dayuse parking. • REI will have some games and prizes setup around the Chill Zone and a raffle sometime after dinner. • After that, we’ll switch to camping mode and retreat to the Lower Tent Sites for a campfire and some needed rest. There are tables at the Lower Tent Sites as well as a nearby bathroom/shower. • Feel free to bring your favorite musical instrument or nighttime activity, just know that quiet hours start at 10pm, or is it 11pm? • Dogs are welcome for camping but need to be leashed. We do ask that you don’t bring your dog on the trail work portion. We’ve seen that sharp metallic swinging tools and dogs are a bad combination. • NOTE: There is nothing planned for Sunday. No trail work. No food. Bring what you need and plan whatever you’d like to do! And that’s the plan man. What did we forget…..? Error: Error validating access token: Session has expired on Tuesday, 26-Mar-19 15:28:48 PDT. The current time is Sunday, 21-Apr-19 05:56:01 PDT.